Livingston is a railroad town, always was, since it sits on the eastern edge of the Rocky Mountains. The right place to make up trains to go west, which will need more power to cross the mountain passes, or go east with much less, since it is largely downhill. When I was a kid, Livingston was one of two places on the line set up to do the heavy work of rebuilding the giant locomotives–originally coal-powered steam engines and then diesel-electrics. The giant buildings with their heavy cranes and machine shops still stand, but other than a bit of work on railroad cars not much is done here any more. The railroad workers union was crushed long ago, and these days it seems the whole town lives on fly fishermen, or, when the year is bad for fly fishing, the moans all say so. For some reason the change from robust railroad town to a clot of folks peddling feathers and guided float trips seems a bit off to me, and puts me in mind of a story about the great Scribner’s editor Maxwell Perkins. A book needed to come out with some haste, and so a roomful of editors and other brainy folk sent for the head printer–in those days publishers had their own printing plants–who came into the room full of three-piece suits wearing his ink-stained shop apron. He was asked if it was possible to print this book with some dispatch. The printer said “yes, of course we can” and went back to his basement and his presses. Perkins looked round the table. “Why is it,”he said,”that when Mister Smith leaves we all look so ashamed of ourselves?” I am old enough to remember what Livingston was back in the late Fifties and early Sixties–a fun place where a young feller escaped from the dull and orderly drills of poor Bozeman, over the hill, could find glasses of beer in the bars, jazz, and a room at the old Murray Hotel for a buck and a half a night. If the young feller minded his manners he could have a very good time indeed, but I also knew that if I tried to order whiskey or got loud I would be drop-kicked through the doors and into the waiting clench of the Livingston cops. I loved the place and came often and slithered quietly and carefully here and there, suspecting that everyone knew what I was and where I came from, just a pissant faculty brat from over the hill. I didn’t know then any of the darker truths about the town, and the darkest for me is this: that the life expectancy for a white male in Bozeman, where I grew up was at that time seventy-two. In Livingston it was fifty-one. The railroad workers, whether in the shops or on the road itself, lived and worked in a stew of petrochemicals and a dusty air of asbestos particles, their wives washed their clothes and came down with environmental cancers, and when I came back here over twenty years ago now I was struck by how many of the old Livingston people I knew had had children die young of childhood cancers. It was a different world from the one I knew and I thought back then it was all good. But it was not. The same old story, about the true cost of industry , and back then no one seemed to care. The union didn’t–it had good jobs at good pay and with good benefits. The corporations didn’t, they were concerned with profits and shareholders. There were plenty of people who did know about it, they had to, the state government had the mortality reports. One political sort who worked for a governor thirty-odd years ago told me that the two places with such starkly low life expectancies were Livingston and the eastern Montana counties where tough cowboys used tougher pesticides and ignored all of the precautions stated as essential in handling the stuff. But there seemed to be no interest in that number, in the twenty-one years of life itself that working for the railroad cost……. Last summer was the most wretched I recall here in Montana, and my memory goes back to the Fifties. No rain, and unusual heat–over 90 more days than not–and a fug of smoke that made everyone hoarse and peevish. Well over a million acres of forest and grassland burned here, well over a million and a half in Idaho, and we get their smoke. Singers couldn’t sing, drivers cursed other drivers more than usual, and down the Paradise Valley a fire began when the bucket on a little Bobcat front-end and backhoe machine struck a spark when it hit a rock. When it is this dry a horse’s shoe can ignite the grass, or the sun shining through a bottle. The fire roared up Pine Creek, and took four houses. Many others were saved by the rural firefighters, and the people who lived on the east side of the valley nearest the blaze were forced to leave their homes, often with only a few minutes warning. No lives were lost, but there was a lot of sorrow for lost forests and houses and the priceless things people accumulate in a lifetime. After the fire was spent people got a bit more aggressive about keeping burnable materials a good distance from their houses, some of which were built in dense forests, which is a bit like having your home on a bonfire, already laid and ready. Montana is very dry at best, and would be a desert if it were not for the mountains and the winter, which accumulates water when it is cold and releases water when it warms up. And it is warming up. Our forests are in bad shape for a number or reasons which I won’t bother with here–the political fights–but more importantly the warming climate allows pine bark beetles to have two reproductive cycles in a year rather than one. So the trees they favor are dying, their vascular systems cut by the tunneling insects. The forests in the mountains now have a red blush which is getting more visible day by day–conifers dying, standing, dry, their needles filled with combustible chemicals. It won’t take much. Last summer wildfires tore through some suburbs of Colorado Springs, Colorado, and looking at the films I had to wonder why anyone would be foolish enough to build where they had, in the foothills of the high mountains–good for up and down drafts–and why they had tree species in plantings that actually need fire to live. The Paradise Valley has more people in it than I like, which matters not a whit, but in other areas near larger towns like Bozeman people have built homes back in the trees, which unfortunately are lodgepole pine, which has to burn to seed. Lodgepole lives about a hundred years before dying of old age, and though many people know of the terrible fires of 1910 which burned northern Idaho and western Montana, fewer know that in 1911 much of the forest over here, in south-central Montana, burned. Of course the lodgepole loved that and came right up, and, well, you do the math. The people who have built back in those forests are independent cusses and they have narrow little roads, dirt, and overhead power lines, and when the fire comes they won’t be able to get out and they won’t have any electricity to pump water on their homes with. Which may not matter, since they will likely all die. Zoning and building codes for many of Montana’s people is Tyrannous Guvverment Intrusinations and they howl they will defend their sacred liberties with their God-Given Constitutional Guns. Mostly gas, but it does tend to discourage sensible public policies on all sorts of matters.And it is hard to find building inspectors who want to go in there and make useful suggestions. God, I love this place and the people in it. Most of them anyway. We all make our lives up, pretty much, and Montanans have wonderful fantasies in the matter of How Things Ought to Be. (Don’t get me started on cowboys.) But it has rained and rained and rained this year, so, not so many worries, but there are other years coming which may not be so nice….. I just returned from a time on the East Coast, in Boston, and it has taken me a few days to recover from it. Boston is a fine city, thick with culture and loud with wonderful music, but it is also crowded and noisy and most of the streets are paved cowpaths one car wide, down which traffic speeds. It is tangled and hard to navigate for a hick like me and I grew frantic with time, and not much time at that. Life is very fast-paced now, and it still seems impossible to me that I can reach the information I want so easily with the computer and the Internet. Change accelerates daily, it seems. I don’t much like it. I never did. Every extended stay in a city has proved disastrous for me, and that is all that I have to say about that. It is a big world and billions of people seem to like living together in close and intimate proximity but I prefer places I might see a coyote. They come through the property I live on, rather regularly, looking for that favorite coyote snack, a nice fat house cat. They eat small dogs as well, and drift back out to their dens. I like coyotes. They are rascals and thieves and engagingly clever. Long ago I saw one robbing a bumblebee nest. The coyote backed up to the nest, waving its tail which the bees attacked, and then the coyote turned slowly, and the bees went on attacking its tail, and the coyote gobbled up the larva and honey and then trotted away, leaving the poor bees utterly robbed. All attempts to exterminate them have failed. Coyotes den in New York’s Central Park. They like suburbs. They adapt very well and very quickly. All very well and good and I salute their strong character and cleverness, and so far as I go, they may eat Boston and everything in it. Me, I do not adapt very well. At all, not to put too fine a point on it. Folks these days make too much a virtue of adaptability, which seems to mean tolerating outrageous invasions of their privacy and lives. Out here, in the little town I live in, things move more slowly. I won’t get run over by a bread truck. I can get up and go down with my dog to see what the neighbors, like the coyotes, were up to last night. They use the same paths every night and leave paw prints. But very quietly. 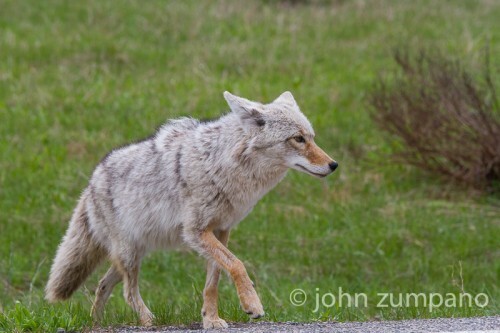 I like the coyotes, who are excellent neighbors…. It is cool and rainy today, and about this time each year the curlews come, and glow rich caramel and yellow in the misting rain…. Last summer was the most miserable I recall, ever. Dry and much hotter–a day or two over 90 degrees is usual, weeks of that are not. The mountains I can see from my window are red, a blush of beetle-killed trees. There will be fire and there should be fire, it is the engine of renewal here, but the smoke is irritating and people lose their houses and the customary order of their lives in minutes. 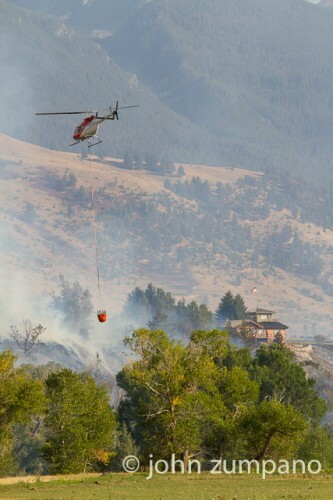 Last year a fire began at Pine Creek down in the Paradise Valley. Wholly accidental, a spark from the bucket of a little Bobcat digging machine, made by steel on rock. Not much, but in moments it was moving too fast to squelch. A good friend was give fifteen minutes to leave her house and all she had. She took her cat and the hard drive from her computer. The fire was kept away by the firefighters, though other homes were lost, and in time she could return and go on. She wept over the lilacs, perhaps a century old. They were charred and damaged and so had to be cut and taken away, but the rootstocks were well established and this year new growth has shot out of the ground, and in a year or two will be as tall as what was lost. We hope for mushrooms. I was in the Blackfoot Valley in 2000, and huge fires burned to the north of me, in the Bob Marshall Wilderness. At night the red glow went across half the horizon, giant trees exploded and the trunks tumbled through the air for hundreds of yards, starting fires if there was fuel to burn. The next year the seral forest erupted and the rodent population exploded and predators thrived so that driving on a paved highway I casually glanced at what I thought at first was a dog and then my brain worked a bit better and I found myself staring at a large wolverine, a creature I have never seen in the wild and many who spend years in the backcountry live long and die without seeing one. Today though it is raining and cool and several more such days are ahead, and we hope for rain now and again this summer. Two years ago it rained and it rained and it rained well into July, so much rain that the Yellowstone River was not “fishable” until the first week of August. (“Fishable” is a river suitable for ferrying dudes down, so they may catch trout which they release which is thought more sporting, but I wonder about that, since an animal dies once and torturing them to death does not seem to my mind to have much moral glow about it.). Livingston now depends for a good portion of its yearly take on fly fishermen, and wails when they do not come. I fish in the winter here since I loathe crowds, and what I hope for now is right after the cool wet weather we get some hot sunny days because that will bring up the morel mushrooms, which may be dried to preserve them and which are one of the choicest mushrooms of all. They come up where the forest fires raged, sometimes in great quantities, and and one very good year I had perhaps a bushel of dried mushrooms to give to friends and hints that this was greatly appreciated do tend to rise to a crescendo at this time of year. They really do not want to be forgotten. Some try bribery but so far the cheap bastards haven’t offered anywhere enough. I sometimes hunt mushrooms with Doctor Shroom, a deranged poet and a songwriter of marvelous and scurrilous lyrics. He is insomniac and so ceaselessly walks the land in search of mushrooms and in hope of exhausting himself enough to get a night’s sleep. His knowledge of mushroom patches is extensive and I am a shameless mooch. …and so in the hope of rain…..